Flak was an abbreviation for Fliegerabwehrkanonen, german for anti-aircraft guns. At the beginning of the war the Flak arm of the Luftwaffe (German Airforce) was nearly a million men about two thirds of the total Luftwaffe. At its' peak in the fall of 1944 there were approximately 1,250,000 men and women in the Flak arm, approximately half the total Luftwaffe. As the war progressed the men in the static home defence Flak units were moved to the mobile field Flak units. Replacing these able bodied men were old men serving in the Home Guard, teenaged school boys, youth in the labour service, women auxiliaries, Italian and Hungarian volunteers and Russian Prisoners of War. The most common heavy Flak weapon was the 88mm. This was a multipurpose weapon that served well as an anti-tank gun, artillery gun and Flak gun. Albert Speer, the German Minister of Munitions, stated that the 88's used for Flak were desperately needed on the Russian Front. The Flak 88 required 10 people to operate it, later in the war this would be reduced to 8 people and it could fire 15-20 rounds of minute maximum altitude of 35,000 ft. The 105mm also fired 15 rounds per minute to a maximum altitude of 31,00 feet. The heaviest gun used was the 128mm. It could fire 10 rounds per minute to 35,000 feet. The 128 had two barrels on a common traverse and elevating mounting. The 128 was used on giant Flak towers erected in the main German cities. For most of the war the heavy Flak weapons fired time-fused high-explosive shells. The Germans were unable to develop a workable proximity-fused shell. In 1943 controlled-fragmentation rounds were introduced for the 88 and 105 shells. These rounds had grooves cut on the inside face of the casings, when the charge detonated the case broke up into a smaller number of larger fragments. This fragmentation round was far more effective against heavy bombers than the regular high explosive rounds. Near the end of the war the Germans developed the incendiary shrapnel. It was a thin-walled projectile containing numerous small pellets. When the shell detonated the pellets were blown outwards and forwards. The pellets were designed to pierce the skin of the aircraft, enter the fuel tanks and start fires in the tanks. These incendiary shrapnel rounds proved to be far more effective than the controlled fragmentation rounds. It was a good thing they came onto the scene late in the war rather than early in the war. A Flak battery was laid out in groups of two or three groups of 6 guns. Later in the war these were increased to 8 guns in each group. With the entry of the Americans into the daylight bombing raids and the increased pressure of night bombing raid the germans would group two or three Flak batteries together with a single command post directing them to engage one target. In the larger cities, Berlin, Hamburg and Vienna, large concrete Flak towers were constructed in pairs. They would have four heavy guns, the 105mm or 128 mms. These Flak towers doubled as air raid shelters for the civilian population. The Germans employed railway Flak units. These flat cars had light and heavy Flak Batteries and were a mobile reserve providin rapid reinforcement to targets considered likely to be attacked. Searchlights were deployed with three (later four) batteries with nine, increasing to 12-16, lights each. The searchlight zones lay were placed in the zone of preparation. Early in the war sound locators then radars were used to find the targets. From 1942 the searchlight battery was positioned close to a heavy flak unit with a 200cm Master searchlight, which had a blue tinged colour. The Master Light would find the target and the three 150cm satellite lights came onto the aircraft to "cone" it. Usually the Master Light was in the centre and the three satellite were positioned 1.5 miles away in the three opposite directions. The Germans saw the searchlights as an effective means of defence, because the glare of the searchlights blinded the bomber crew and prevented any sort of accurate bombing run. The Flak batteries and searchlight batteries were positioned in an all round defense because the aircraft could come from any direction. The Flak units were set up on the basis that bombers would fly no faster than 265 mph and no higher than 20,000 feet. A bomb released from 20,000 ft would travel forward 4,400 yards before impacting (B is the bomb release point). A potential target would be picked up in the Zone of Preparation (C). The target would be tracked with two radar units, one for altitude and one for speed. This information was feed into the predictors which sighted the guns. The predictor requires continuous input for target bearing, elevation, and range, in order to calculate the position of the target at the time of projectile arrival and fuze initiation. Radar was used to provide this information, which could also be obtained by optical systems (if you can see the targets). 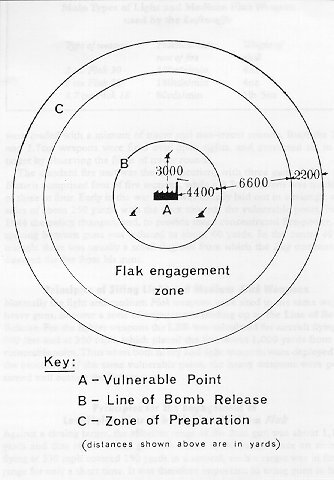 The Flak would engage in when the Bomber crosses into the "Flak Engagement Zone" area, which would be the area the bombers would start their bomb runs. At a speed of 265 mph the bomber would be in this zone for approximately 60 seconds. If the targeted bomber managed to make it to the point where it released its' bombs at the "Line of Bomb Release" (B) then the Flak Battery Commander would have the Flak gunners track a new bomber target in the "Zone of Preparation" (C). Each Flak Battery had a minimum of two sets of radar and two predictors. This way, when they disengaged at target that crossed point B or successfully shot down the targeted bomber they could immediately engage another bomber. If the Flak batteries had accurate predictor data they would open up on an aircraft at their maximum effective range, for the 88's it was 10,000 yards. The priority target was the aircraft at the head fo the formation. All guns in the battery engaged the same target aircraft, firing by salvos as rapidly as possible. The three Flak Batteries would be laid out in a triangle about 3,000 yards from the fire control centre. If there were five Batteries four would be at the corners of a square with the fifth near the vulnerable point as practical.